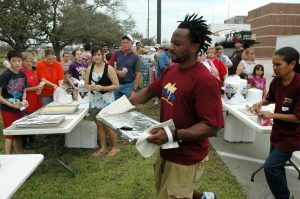 Bridge City, TX – volunteers distribute food to residents affected by Hurricane Ike. American Red Cross – The American Red Cross is often the first to a disaster area, providing food, shelter and comfort. Volunteers constitute about 90% of the American Red Cross workforce. Social Media Campaigns in Community Recovery – While not an organization, a growing number of state, county and municipal governments have established plans for using social media as an information gathering and outreach tool in the event of a disaster. If disaster strikes your area, join one of these online disaster recovery communities, and if none are evident, consider working with others to create one. Here are some lessons learned while doing so after the 2011 Joplin, MO tornado and other recent central U.S. natural disasters.